What an exciting adventure it was to join William Cepeda and members of AfroBoricua in Puerto Rico during our historical investigation of Santiago de Apostol, patron saint, and one of the most important figures of the town of Loiza Aldea and of our Celebrando 2005 season project dedicated to the folklore of Loiza! 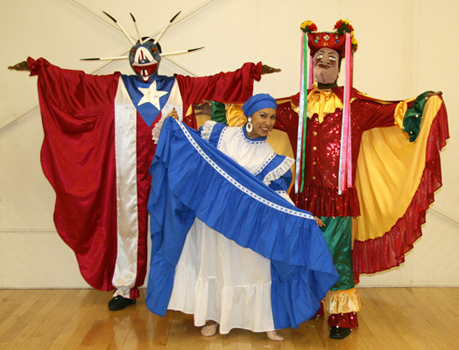 Years of research culminated in a live music and dance production entitled Celebrando 2005 - Viva Loiza, a joint performance between William Cepeda, AfroBoricua and PRFDance on June 25-26, 2005. Enjoy these historical notes behind one of the several Loiza traditions we presented at Celebrando 2005, the Festival of Santiago Apostol and the colorful characters the world loves -- the Caballero, the Vejigante, El Viejo, and La Loca. The Festival of Santiago Apostol reflects Spanish traditions transformed in the new world. The devotion to Santiago, St. James the Apostle, began in Spain in the early decades of the 9th century when on July 25, the Bishop Teodomiro was guided by a star to the tomb of the Saint. In later years, people from all over Europe would make pilgrimages to visit the Saint. In the first years, the faithful conceived Santiago as a humble fisherman of Galilee, a companion of Christ. It was in 844, during the wars between the Christians and the Muslims, that the Spaniard's conception of Santiago changed. A legend tells of a battle where the Christians, fighting at a great disadvantage, were saved by Santiago who, dressed as a knight and riding a white horse, appeared in the Muslin camp and defeated the Moors. After that, the images and paintings of Santiago always depicted the saint as a Spanish knight, mounted on a white horse with a flag in his left hand and a sword in his right. From then on the Spaniards called on Santiago for help in time of war. The devotion to Santiago came to Puerto Rico with the Spanish conquistadors. In 1514, Diego Colon founded one of the first towns, on the east coast of the island, and called it Santiago del Daguao. The next year, the Saint was called upon to help the Spaniards fight the ferocious Carib Indians on neighboring Vieques island, in revenge for an attack the indians had made on the farms in Loiza. On many occassions thereafter, Santiago was depended upon to help the Spaniards in their fights against the Caribe indians, and later Europeans, like the English and Dutch, who tried to take the island. By the early 1600s, the Island annually celebrated the feast day of Santiago every July 25th with great enthusiasm. 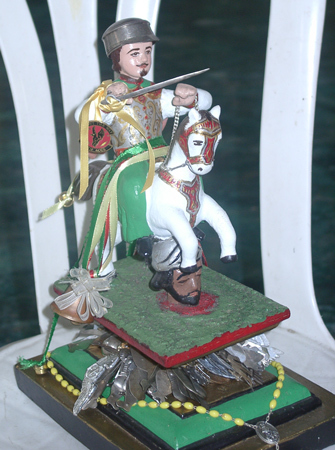 Although the origin of the Festival de Santiago in Loiza is unclear, one could imagine the slaves becoming devoted to the Saint as they picked up arms and fought along side the Spaniards to defend their families, towns and homes. The image of Santiago the Spaniards depended on for help was not so unlike some of the slaves own gods: Ogun, the god of War, and Chango, the god of lighting, thunder and storms. Santiago himself was not only considered the saint of war, but also the "son of thunder," capable of sending fire down from the sky to destroy the enemy. 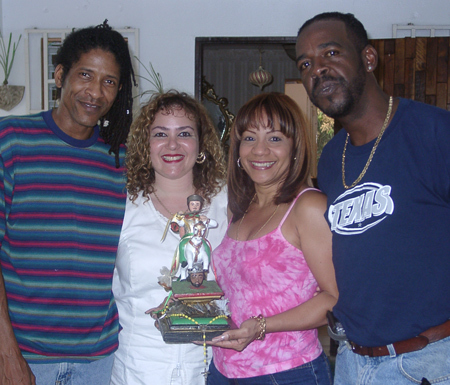 West African culture and traditions brought to Puerto Rico by the slaves were preserved in Loiza thanks to poor roads and limited means of communication that isolated Loiza from other towns in the early days. For this reason, although the devotion to Santiago died down in other parts of Puerto Rico, this tradition was preserved in Loiza through the centuries and each year is still remembered in a week-long festival beginning July 25 that include both religious ceremony and carnival celebration. Anyone who visits Loiza during this time of year can't help but enjoy the lively carnival traditions, and towns people who dress as one of four historic characters to delight and entertain: the Caballero (Spanish knight), the Vejigante (Evil), El Viejo (men dressed a raggedy-dressed old men), and La Loca (men dressed as crazy ladies who sweep streets and balconies asking for money). "La Fiesta Santiago Apostol en Loiza Aldea," Ricardo Alegria, Coleccion de Estudios Puertorriquenos, 1954.